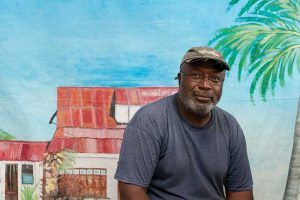 The late Sherlin Williams at his home photo studio in Grand Turk. The first time I met Sherlin Williams was in the Museum Science Building’s workshop. He was just putting the finishing touches on the 150 year-old clockwork mechanism that made the light turn in Grand Turk’s lighthouse. I was amazed because it was an intricate piece of equipment for which no plans or instructions were available. He had been working on it for months, and through observation and persistence alone figured it out by himself. It made more sense later when I learned that in previous years he had a business in the Bahamas repairing high-end cameras! Sherlin didn’t just repair cameras, he was a pretty good photographer too! In 2010, he showed me computer-manipulated artwork he was producing called “photocraphs,” each composed of dozens or even hundreds of different images combined to tell a story. Mr. Sherlin McDonald Williams died on January 2, 2017. He was an avid supporter of the Museum, a good friend, a native son of the TCI and one of its most ardent and active local historians—but he is not lost to us. He is still here in the Museum. You can hear him in the words he wrote, see photos of him working to conserve other people’s history, and admire the art he created, all preserved here in perpetuity. 1995: When the Museum’s first Director, Barry Dressel, became interested in the history of Grand Turk’s salt industry, he discovered that Sherlin had grown up on Grand Turk when the salt industry was still in full swing and had witnessed salt production in action. Sherlin pointed out that there were a number of different types of windmills still standing, but only one example of a type called the “carousel” was left. It was in the Town Salina only a few blocks from the Museum. He said the salina is always flooded these days, but the walls people used to walk on between ponds were still there, just under the surface and we could walk out to see it. We took our notepads and cameras, rolled up our pant legs, and followed him out to the site. Passers-by stopped and stared. It had been years since anyone had seen people in the salina and it must have looked like we were walking on water! Sherlin measuring windmill drive shaft. 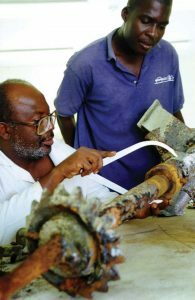 1998: (At right) Sherlin is measuring the “drive shaft” of a windmill that the Museum recovered after it collapsed into the North Salina. As a child growing up on Grand Turk, Sherlin was fascinated by the windmills that were fully operational then. A careful observer, he understood how they worked and how they circulated the water in the salinas to increase the efficiency of the process of reducing tons of seawater to handfuls of salt. We learned more from him than from all the written references on the subject in our library. The wooden timbers of the windmill were too far gone to save, but Sherlin wanted to save the iron parts so the Museum could reconstruct the windmill one day and put it back into service. He wanted it to serve as a memorial to the folks who worked in the salinas all their lives and made Grand Turk’s salt industry world-famous. 1999: Sherlin was not directly involved in making rubber moulds of the inscribed rocks on Sapodilla Hill in Provo, but he eagerly dived into the hardest part of the project—making resin casts of the inscriptions in the Museum’s “wet lab.” I experimented with various combinations of plaster, resins, hardeners, fillers, and release agents until I found an ideal formula. It was a difficult and tedious process and once you got started you had to continue until it was finished which meant long days and long nights! But Sherlin hung in there. Altogether we made more than two dozen casts over a period of weeks. The resin casts all come out of the rubber moulds a brilliant white. He “cosmetized” them with watercolor washes to make them look exactly the way they do on the hill. 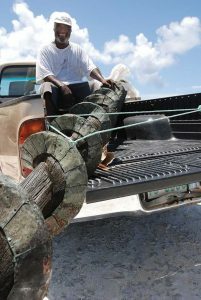 Sherlin with the “Archimedes Screw” salvaged from the Grand Turk dump. 2010: (At left) Grethe Seim saved this “Archimedes Screw” from going to the dump decades before the Museum was created and took it to her home for safekeeping. She wanted it to go to the Museum but it took a long time to figure out how and when to do it. We had to hunt for it because it had been kept outdoors and the bush had grown up around it. In a reversal of roles, Sherlin cleared the bush while I took the photos! A group of Chinese laborers working on a house nearby cheerfully carried the screw uphill through the bush to the truck for the trip back to the Museum. Once we got it there, Sherlin cajoled Mr. Oswald “King Oz” Francis—the only person who remembered when it was made, what its purpose was, and where it came from—to come over and tell us its history. 2012: Like me, Sherlin was enthralled by the Grand Turk Lighthouse. As a photographer, he saw its majestic, photogenic potential. As an archaeologist, I saw a magnificent, intact machine from the early industrial age with a plethora of mysteries to unravel. We visited it together many times although gaining officially sanctioned entry was often tedious. A spiral staircase to leads to the “lamp room” where the actual light is. There is a clockwork mechanism all the way through the height of the lighthouse and into a hole in the ground beneath it. The 400 pound weight pulled down the tube by gravity is what turned the light all night. 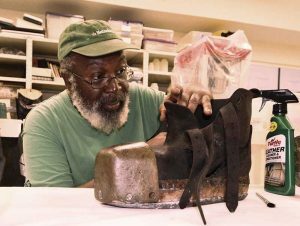 Sherlin rehabs a 19th century pair of lead, leather and brass diving boots from England. 2013: For the exhibit featuring the exploits of the larger-than-life helmet diver Jeremiah Murphy, who lived on Grand Turk, we had to locate and purchase all the equipment to fit out a 19th-century helmet diver. We found a pair of lead, leather and brass diving boots in England, but when they arrived, we found the leather to be dry, hard, and fragile. Sherlin worked for weeks bathing the leather in two types of cleaners and conditioners to get it supple enough to use in the Museum’s exhibit. 2013: One of the last projects we worked on together was creating the “Golden Age of Grand Turk” exhibit featuring a reproduction of the “lamp room” of Grand Turk’s lighthouse. No plans of the lighthouse survive, so we had to measure, photograph, and document it from scratch. Ironically, the first work he did for the Museum two decades earlier was restoring the clockwork mechanism that led to the creation of this exhibit. 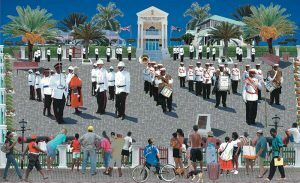 Over the course of 30+ years as a photographer in TCI, Sherlin compiled tens of thousands of photos, including those of many buildings, especially in Grand Turk, that no longer exist. As his craft became digitalized, Sherlin went abroad and took courses to become fluent in image and layout-focused programs. When he started experimenting with the creative possibilities, he found he could use his life’s massive collection of photos in a new and different way. Each “Photocraph” encompasses anywhere from dozens to hundreds to thousands of individual photos, carefully “cut,” “pasted,” modified and placed into a computer file to form an original work of art. One of his favorite pieces, entitled “The Mule Breeder,” included nearly 3,500 individual items and took four months to complete. Shown above, “Hillary Session” is one of the “photocraphs” Sherlin created in about 2011. Tragically, a year or two later his computer was stolen, his health began to deteriorate, and he was unable to continue pursuing his art.